As the region and our nation observe ten years since Hurricane Katrina changed New Orleans forever, we at Catholic Charities Archdiocese of New Orleans reflect on our ministry and look forward with hope and grateful hearts. Please watch our Katrina 10 commemorative video and share the gratitude with others. Click here to view the video. to the Junior League Diaper Bank, where in turn, the diapers and supplies would be sorted to be distributed through Catholic Charities ACCESS Diaper Bank. With the help and support of community partners like Junior League and Entergy, ACCESS has been able to distribute approximately 10,000 diapers to moms and babies in need each month. For more information about how you can help or receive help through the ACCESS Diaper Bank, please visit the Maternity and Adoption Services pages on our website. 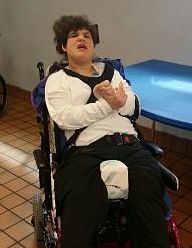 Thank you to St. Vincent de Paul Ministry of St. Pius X for their generous gift of a custom wheelchair for one of our residents at Padua House! You can tell she loves her new wheelchair! If you would like to support the angels of Padua House, please click here and write Padua House in the Special Instructions Section. 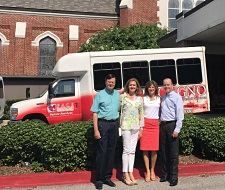 Introducing the 2015 Archbishop Hannan Community Appeal Chair Couples: "The LeBlancs"
In early August, the 2015 AHCA Chair Couples, Price & Christine LeBlanc and Clifton & Elizabeth LeBlanc, went on a tour of several Catholic Charities program sites and met with key leaders in the organization to learn more about the scope of ministry Catholic Charities provides throughout the New Orleans area. For both couples the “pilgrimage” was fun and informative. Stay tuned for more information about the 2015 Archbishop Hannan Community Appeal. Did you know onthly giving maximizes the impact of your gift? Catholic Charities’ Partners in Hope donors are our partners in the truest sense of the word. Each month, you can provide consistent and invaluable support to serve the poor and vulnerable, allowing our staff and board of directors to plan carefully for the future. Through an ongoing monthly gift, you help those in need and become a life-line for the elderly, the disabled, the homeless, the hungry, and many of your neighbors. Won’t you be our Partner in Hope?